Mechanical Comparators are the type of comparator which is made up of mechanical means. What mechanical means? Is this is a question raised in your mind too? Mechanica Means are levers, gears, racks and pinion, such kind of means are used to magnify the movement of means to improve the accuracy of the instrument. Why do we need magnification? and what is magnification? There are four types of mechanical comparators available. Advantages and Disadvantages are discussed at the bottom of this article. 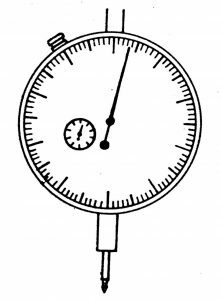 The Dial Indicator is used to measure the small measurements accurately. There are two types of dial indicators. Johansson Mikrocator was first developed by C.E Johansson so from then on words it was named as Johansson Mikrokator. Instead of gears or rack and Pinion, it uses a twisted strip to magnify the small linear movement of the plunger to Indicator(Pointer). So it can also be called as Twisted strip Comparator. There is another name is available for this Comparator. That is Abramson Movement(Too many names right? ☺) this is Why because of the mechanical magnification designed by H. Abramson. The main components are a Twisted strip, Bell crank lever, Cantilever strip, Plunger. What is meant by Reed In Reed type mechanical Comparator? You also wondered what it is? Reed is a Long supporting rod/Shaft. In Reed type mechanical comparator we use a number of Reeds to avoid frictional contacts. See the following image of a Reed type mechanical comparator. We use four reeds, two blocks, a pointer, scale(dial) and a Plunger(Spindle). Out of four reeds, two were placed vertically(D) and two placed horizontally to connect the two blocks( A and B). Here ‘A’ block is fixed block, whereas ‘B’ block is floating Block. Observe the Gif. that will make sense how it is exactly working. Continue Read about Reed type Mechanical Comparator Full article Here: Reed Type Mechanical Comparator. This Sigma Comparator is also provided with a frictional less linear movement as like Reed Tye Mechanical Comparator. The Sigma comparator has the Plunger, Knife Edge, Cross strip hinge, Slit diaphragm, a pointer and some other small components are also there. 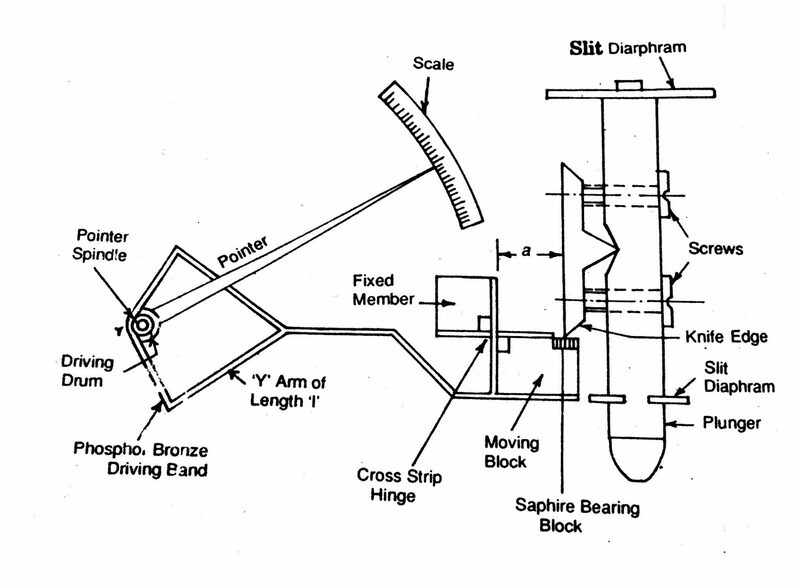 See the following diagram of Sigma comparator. Continue Read about Sigma Comparator Full article Here: Sigma Comparator. These are the mechanical Comparators available. Let’s see what are the advantages and Disadvantages of the Mechanical comparators. These are cost-effective and cheaper than the other instruments. These Mechanical Comparators don’t use any resources such as electricity or Air or Oil. Easy to handle and Robust and compact designed. Due to moving parts tends to less accuracy than the other type of Comparators such as Optical Comparators. The range of this instrument is limited to a particular application.